So you’ve designed a game where it’s hard to transition from reading the rules to playing intelligently. Maybe the player has options whose import–the “why” as distinct from the “what”–aren’t clear just from reading the rulebook, or perhaps the game is just too complicated for new players to be able to devote much thought to strategy. Everything is fine once someone is invested and has discovered the game’s tactical nuances, but the learning curve is more like a cliff. How can you help new players understand their choices, so that they don’t just quit in frustration? There’s an often-overlooked solution: simply tell them. GMT makes Fire in the Lake, its excellent-but-complex simulation of the Vietnam War, approachable using that exact method. Fire in the Lake has two big humps in its learning curve: first getting through the dense rulebook, and then understanding how the rules are applied on the tabletop to make progress toward winning. By being straightforward about what each maneuver is intended to accomplish, GMT gives players a tremendous boost over the second hurdle. You see, there’s a lot for new players to take in when they start to learn Fire In the Lake: four factions, each with their own victory conditions and unique actions. It doesn’t get easier when one considers that each action has multiple parts. 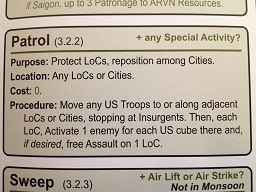 A US player, for example, can assault with her own troops in any of several locations (which costs no resources), then has the option of forcing her ally to attack (which does cost resources). How many pieces are removed by the assault depends on who’s attacking–the US or her ARVN ally, the terrain, and whether or not the US has established a base at that location. The US player also has three other actions she can take, plus three additional helper-actions which can’t all be combined with all of the main options. Her choices are also, by the way, contingent on the monsoon. It’s the first line that’s key. Having the execution details of a patrol–the cost, where patrolling troops can move–was useful. The greatest value, though, came from that first line: “Purpose.” Here’s why you would do this; you’ll get the following out of it. All of a sudden it was possible to make meaningful decisions. I had been getting ready to take actions “just to try them out,” accepting that the match would basically be an extended tutorial. Equipped with some basic information about what I could expect from each action, however, I was able to pursue a coherent strategy right away. It’s worth pausing to reiterate that. A few lines on the player aid saved me from a four- to six-hour tutorial, and launched me right into the exciting part of the game. Those couple of sentences granted an enormous return in player engagement. Fire in the Lake isn’t the only game that can benefit from explaining when and why certain moves are useful. Consider, for example, chess. The rules of chess are quite simple. Even small children can easily learn the game. However, the strategic implications of the choices available are complex and often opaque. On his first turn a player can move a pawn, or jump with a knight. When is one better than the other? Why? If he should move a pawn, which one? How many spaces forward? I’ve never heard anyone say that they stopped playing chess because they couldn’t learn it, but I’ve heard people say that they just found it overwhelming. Now imagine how much more accessible chess would be if every set came packaged with some basic information about what various moves accomplish. This opening brings the bishops and rooks forward to useful positions; that maneuver threatens the opponent’s pieces. Suddenly the player could to evaluate positions, at least in a simple way, and make informed choices. If he wanted to bring the bishops and rooks forward, he might try these moves; if he preferred to get his queen involved, he would at least have an example of what not to do. Of course, that sort of information is readily available; there are any number of chess resources out there. Seeking them out, however, requires a level of investment that cannot be assumed of new players. When the problem is getting players engaged in the first instance, there’s no better solution than putting valuable help in the one document they’re most likely to read: the rulebook. When there’s a divide between a game’s rules and its strategy, however, a little explanation can go a long way. Helping players out with a brief statement of how each option might contribute to a strategy does a great deal to bridge the gap between reading the rulebook and having fun with a game. If nothing else, it avoids four- to six-hour tutorials! Since I am less familiar with the other games you mentioned, I’ll just confine myself to commenting about Chess, for which I have enough experience to make a reasonable discussion. I am not sure if showing certain strategies and reasons for them, as you mention, would really be of much help. Looked at it one way, they actually increase the time required to go through the game’s manual. Personally, I would prefer to go through the basic rules of a game and get them down first, with tactical strategies at a second or later session. Trying to learn both at once is just extra information overload. Even if you assume it is quick to show a few basic moves and their reasons, I feel that this will not really determine whether they quit the game (permanently) or not. One reason is that such a quick treatment could only cover a small subset of the basic strategic points of chess, and wouldn’t really help against an experienced player. My experience of why people stop playing chess is because they consistently loose to whomever their opponents happen to be (friends, whatever), and they lack the motivation to take things the next mile by investing hours in learning a new strategy. If you have a person who doesn’t mind loosing and has the desire to keep playing (maybe they find the act of playing itself fun regardless of win or less), then they can hang around longer to gather experience and increase their skills. If the goal is to keep players from quitting, then I feel accomplishing that effectively would depend on their age group and reason for playing. For example, for kids learning chess the manual or related materials could use cartoons or something to keep their interest. For adults, a more dry and serious strategy would work better. I definitely see your point about adding to the manual. Creating barriers to entry is rarely desirable, and I’ve seen people turned off games when the teacher got away from talking about *how* to play to dwell on how *best* to play. GMT actually goes one better than that: they have a complete tutorial, but it’s in an entirely separate booklet from the rules! Someone who just wants to read the rules and dive in can ignore it completely. I think FFG has started doing something similar. Still, I think you’ve raised a great point. Helpful information is still information, and new players can be buried under it. I never made it very far in chess, so I can’t deny the possibility that I’m all wrong about the game. 🙂 It’s certainly true that the rules can’t be expected to make a beginner the equal of a master. However, the rules could at least let the beginner try to execute a strategy, instead of stumbling until the master cleans up. Couldn’t agree more with this article. With the number of games a lot of us buy and have access to, the first one or two plays of a game are crucial in determining whether that game is ever played again. For this reason, you really want to have an idea of vaguely what you should be doing the first time you are playing. I’ll often understand the rules perfectly but have no idea the purposes of the different actions and therefore have little idea of how the game is meant to actually play out. As a result, the game often doesn’t go as intended or feels like it is all luck-based because it is not clear what a good action is until you’ve actually played through an entire game.